We are a family run pet care service offering quality home from home bespoke boarding in tranquil surroundings for guests throughout Oxfordshire and beyond. We have over 30 years experience caring and owning pets from hamsters to horses so you can be confident in the knowledge that your beloved pet will be treated with respect, love and care during their holiday stay. Here at the Ark our aim is to provide a personal as well as professional service with your pets welfare being most paramount as well as being accommodating as possible. For the well being of our guests and other pets we do ask owners to ensure their pets are up to date with the necessary vaccinations and a copy will need to be seen. For extra peace of mind we hold a First Aid Certificate for Small Pets Care and are police checked. Regardless of the weather guests will be handled and enjoy lots of human interaction on a daily basis. Holiday Ark regularly receives referrals from local vets which is a great honour. 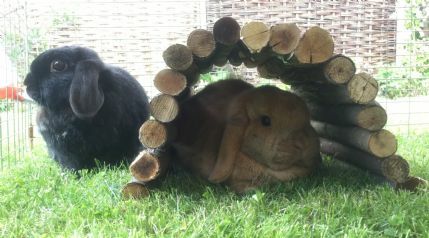 All accommodation is Rabbit Welfare Trust and Fund approved. We use luxury 6FT hutches (which are all visible from the house) with made to measure thermally lined waterproof and windproof covers ensuring guests will be cool and receive shade in the summer and warm in the winter. Heat pads are also available to keep our guests snug. All we ask is for clients to provide their own pet food as Holiday Ark supplies bottles, bowls, unlimited locally produced meadow hay, vegetables and herbs. Water is replenished daily. Upon request, we may be able to provide indoor accommodation. Spacious, well constructed non rust metal large outdoor runs with tunnels, toys and outdoor houses providing shade during the summer months as well as ensuring a boredom free stay. A bottle or bowl depending on which is your pet's normal routine will be attached to the exercise run whilst they are enjoying play. A safe good sized garden enables our large exercise runs to be moved daily ensuring guests are always grazing on fresh grass as well as having covers for exercise in the shade. Pets are able to freely display natural behaviour safely, such as hopping, jumping, running and foraging. Your pet will always be seen from our home in the secure garden. We use ample barley straw as well as dust extracted shavings for bedding. All accommodation is spot cleaned daily using a veterinary approved disinfectant. A full hutch clean, including bottles and bowls using the same disinfectant is carried out at the and of each guest visit. Unlimited fresh hay is given on a daily basis. We have a number of Ferplast 100 cages (approximately 100cm x 60cm), suitable for guinea pigs and dwarf rabbits. These are kept in a heated/insulated shed with a radio softly playing the animals' favourite tunes. Please note due to high demand we have a minimum charge of 5 days boarding which is £45 for guinea pigs and £55 for rabbits. Police checked dog walking as well as pet first aid trained. Our good sized pet garden is surrounded by shrubs and offers an idyllic retreat for your rabbit or guinea pig. This service does not include administering medication and is only for well pets. Jackie has been looking after our guinea pigs for several years; always given an excellent and caring service. We would not hesitate to highly recommend the Holiday Ark. Jackie has taken such good care of my rabbit Arthur on a number of occasions, both visiting him at home and having him to stay. I cannot recommend her highly enough. She is extremely knowledgeable on how to care for rabbits and takes such great care of the animals. She is also extremely helpful and accommodating to humans too! It is such a relief knowing that Arthur will be in good hands while I'm away. Jackie offers a very professional animal sitting service. She looked after our lovely rabbits Bramble & Thumper many times before we moved to Cambridgeshire. We were delighted to hear that she was able to look after our new rabbits Marley and Tigga when we returned 4 years later. We would recommend Jackie to anyone looking for a professional, caring animal boarding service. Jackie has looked after our house rabbit Mary Lou on a number of occasions now and we really couldn't imagine anyone looking after her as well as Jackie has. Mary Lou always comes back to us in great condition, happy and healthy. Jackie is incredibly personable and clearly loves the animals in her care as much as their owners. Furthermore, Jackie has gone above and beyond for us and really got us out of a tight spot. After Christmas, I had booked a taxi to take me to collect Mary Lou but the estate was not big enough for her cage. Jackie instead delivered the cage back to us, following in her van. Really above and beyond. In my experience, Jackie gives exemplary service and I couldn't imagine leaving our pet with anyone else. My wife and I are very grateful to have found The Holiday Ark. They have taken fantastic care of our dearest rabbits during years, we are very happy with their service. We are always at ease knowing that they were with you while we were away. Our rabbit has been staying with Jackie for years - she knows how to take care of animals and it is great to be able to leave him in good hands. We are conveniently based in Kidlington (behind Sainsburys in Kidlington) just of the A4260 or 10 minutes south from Junction 9 off the M40. We are about 5 miles north of Oxford which is a crossing point from west to east along the main A40 trunk road and A34 north to south.